Anyone else notice cracks in the upper, inner door Panel strips? 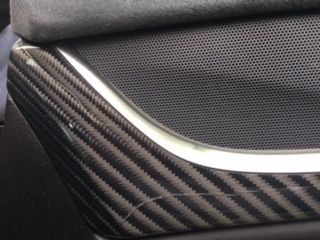 If you are referring to the carbon fiber inserts - then yes, my '14 has two cracks in the one on the passenger's door. Automobile(s): 2014 ELR fully loaded baby! Well this is concerning. You don't expect that in car that cost as much as this one did. Well more quality issues I need to look out for, when do the cracks start happening? This isn't covered under warranty? It could be - I bought mine used and it had been listed as a fleet vehicle in the CarFax report - I suspect it was an Enterprise Luxury rental car. I thought the cracks were scratches (from rental car abuse) until OldDrummer55 blogged about them as being cracks. Time-wise my car is still under warranty (Feb 12, 2018) - but there's over 50k on the odometer. Maybe if I can convince the dealership to repair - not sure yet. Did you get any resolve to this issue. I just took my car in with two similar cracks and the dealer denied it under warranty????? Model-specific trim pieces are some of the first parts to disappear on low-volume Cadillacs, and the ELR certainly fits the bill. Once the 2016 ELR warranty period expires, GM is no longer bound to carry parts. Buy what you can while you can. The pain XLR owners have been experiencing for years is a taste of things to come for ELR owners who wish to keep their cars long-term. Once the word is out that critical parts, (like head and tail lights) are no longer in stock, the desirability of the vehicle plummets, (Who wants to pay thousands of dollars for a used light?) and formerly die-hard owners sell and move on. Insurance companies will total an XLR for front and rear end damage (since replacement parts have to be new).